Nero Port Laurent, also known as Noir Port Laurent is a very elegant and sought after marble, whose quarries are located in Morocco. 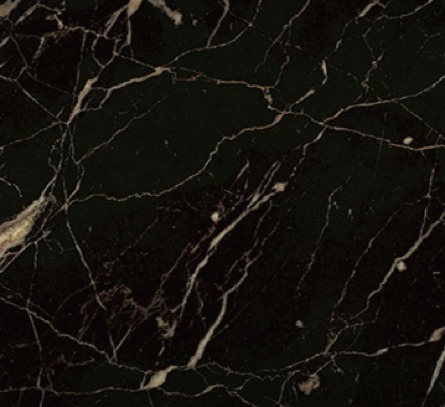 Nero Port Laurent has a dark black colour, dominated by golden white veins which are particularly endorsed when the slabs are polished. In fact, thanks to the crystalline structure of this marble, the polishing gives to the slabs a great brightness. The blocks of Noir Port Laurent have medium-big size and they are discretely available. Given the delicacy of its colour, this marble is mainly used for indoor applications and it is particularly valued for bathrooms coverings and other small inserts in white or light floorings, where it can be combined with other marbles. The slabs of Nero Port Laurent are usually resined, in order to fix every possible defect of micro-crack. Ziche can carry on the resining of the slabs in the modern factory in Brescia (IT), where the vacuum resining with epoxy resins is applied three times to each slab. Nero Port Laurent can be used for floorings, stairs, claddings, countertops,..